Lubin Upper Ten for Her Sample Upper Ten for Her opens with a sweet, tart blend of Isabella grape and bergamot, spiced up with elemi and artemisia. At its heart is Bulgarian rose, mingled with raspberry liqueur and Sichuan pepper, which gives way to base notes of precious wood enriched with amber, frankincense, and a hint of dark chocolate. Top notes: Bergamote, Isabella Grape, Elemi and Artemisia. Heart notes: Bulgarian Rose, Raspberry Liqueur and Sichuan pepper. 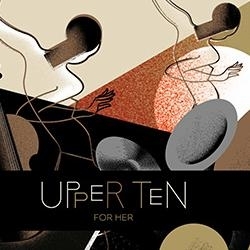 Upper Ten for Her opens with a sweet, tart blend of Isabella grape and bergamot, spiced up with elemi and artemisia. At its heart is Bulgarian rose, mingled with raspberry liqueur and Sichuan pepper, which gives way to base notes of precious wood enriched with amber, frankincense, and a hint of dark chocolate. Top notes: Bergamote, Isabella Grape, Elemi and Artemisia. Base notes: Precious Woods, Amber, Frankincense and Dark Chocolate. Marion skims through the Gotham City night in her sleek Duesenberg, kicking up her heels and sipping bootleg cocktails at the Ziegfeld Follies and whisky at the Savoy. She dances the Lindy Hop then strikes languorous poses, smoking Turkish cigarettes while Sweetheart pouts sulkily – but life’s too short, and there are so many parties to go to! ‘Upper Ten for Her’ is the fragrance that lingers in the wake of these stylish flappers during their extravagant evenings on the town.